BROWARD COUNTY, FL - Broward County&apos;s Port Everglades is hosting its 6th Annual Keep Port Everglades Shipshape painting party on Saturday, May 21, from 9AM until 1PM, in time for National Maritime Day. 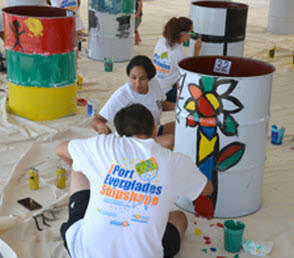 Keep Port Everglades Shipshape gives community volunteers the opportunity to test their creativity by painting recycled petroleum drums that will be used as decorative trash and recycling bins throughout the port. During the awards ceremony, participants learn about the economic impact Port Everglades has in the community and the important contributions that mariners make in international trade and cruise travel. In its sixth year, &apos;Keep Port Everglades Shipshape&apos; is a port-wide campaign held to encourage recycling and cleanliness at one of the world&apos;s leading cruise and cargo seaports, Port Everglades. The event recognizes National Maritime Day, which is a national celebration to honor and recognize the maritime industry and its benefits to our country. Participants over the age of 18 must present government-issued photo identification, such as a driver&apos;s license or passport, at the I-595/Eller Drive security entrance gate to Port Everglades. This year&apos;s event will take place in front of Cruise Terminals 22/24. Please wear comfortable clothing that can become stained by paint. Don&apos;t forget sunscreen. Volunteers will receive a t-shirt for participating. Participants are encouraged to use the Port entrances located at Spangler Blvd./Federal Highway or Eller Dr./I-595 due to a large event at the Greater Fort Lauderdale/Broward County Convention Center.